Once the Palm Tree Harbour Fish Camp, “Mama B” purchased the Old Fish Camp in 1999. 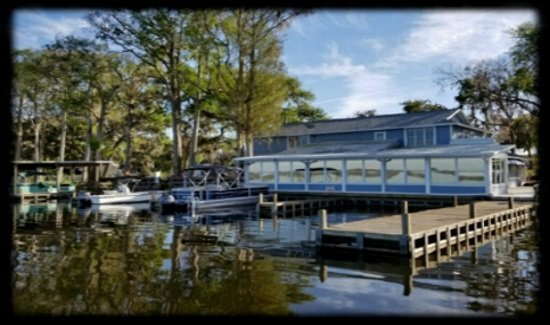 “Mama B” completely refurbished the bar, kitchen, docks and deck then naming the establishment “JB Boondocks Bar n’ Grill“. Since refurbishing JB Boondocks Bar & Grill located in Howey-in-the-Hills, the restaurant has become a favorite gathering place for both locals and visitors alike. JB Boondocks is located directly on Little Lake Harris in Howey in the Hills. Want to come by boat? JB Boondocks boasts more than 20 boat slips, you can even park your seaplane. So come and enjoy our outdoor or indoor dining, entertainment and more. Want to view our menu? 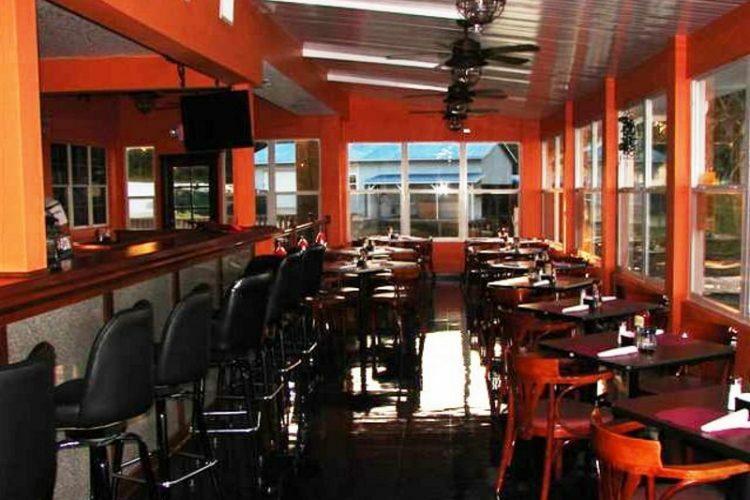 JB Boondocks Bar n’ Grill Restaurant is located directly on the western shores of Little Lake Harris. The restaurant is a landmark in the picturesque town of Howey-in-the-Hills which is also the location of the well known Mission Inn Resort with its two outstanding golf courses, on-site tennis pro, lakeside marina, and luxury homes. 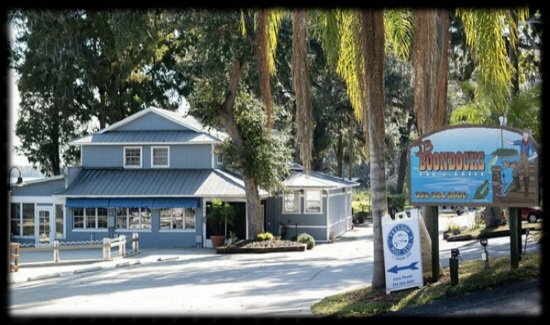 With over 20+ years in the same location JB Boondocks has become known for it’s high quality food and business standards. We expect nothing less of our food on premise as we do in our own homes. Have a question or a special need or request just ask your server. JB Boondocks is well known for it’s superior bar tenders. Always willing to listen, take part in a joke, have some fun and of course serve the coldest brew on tap in town. Cocktails… just name your flavor. So c’mon in pull up a chair and enjoy the Lake view from inside or out. A family run business you’re sure to run into a family member, sister, brother, husband, wife, aunt, uncle, who knows… but guess what? Here at JB Boondocks you’re family. So as visiting family you just get to sit back and enjoy the atmosphere, great food and great people. Join Our Members Only ClubFor Special Discounts In Your Inbox!! 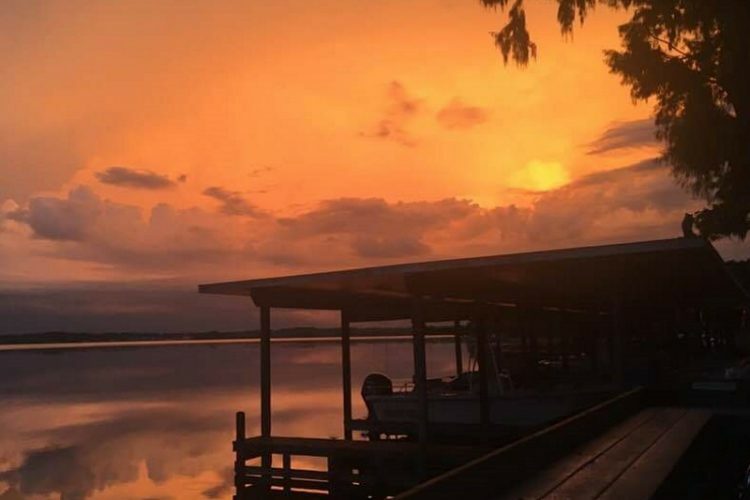 The sunsets at JB Boondocks Bar n' Grill are some of the most beautiful on all of Little Lake Harris. Franks been cook'in up some great cocktails as spring is right around the corner. Our service and food today for brunch was very good. We were seated quickly and greeted by our server, Tonya. Our food was ready quickly and was very good. One of the managers stopped at our table during our meal to insure that everything was good. My brother and I just visited JB Boondocks, we shared the calamari with both marinara and the pepper vinegar sauces, it was fantastic!! We sat inside overlooking water, view was great!! I had the Mahi sandwich, blackened and seasoned perfectly with good sweet coleslaw! My brother had Rubin sandwich and he rated it excellent. Waitress was wonderful and quick with service! Great place for waterfront view and good food!! Great service, fabulous food, the shrimp and grits is amazing and middle neck clams!!! Yes!!!! We will definitely be back soon. This is probably our favorite fish and chips place. The service is friendly and helpful with menu selections. The atmosphere is sea shack fun overlooking little lake Harris. My husband and I stopped in for dinner after a day of golf and decided to revisit for lunch on our way back home. Leave room for dessert, the mint chocolate cheesecake is my favorite! But the key lime is equally as delicious! Driving through Howie in the Hills and time for lunch. So happy we saw your place! Excellent food and view of Little Lake Harris. I wish we lived closer. We will be back. Our waitress was so friendly we felt like regulars! The setting makes this place. Nice fall day sat outside. We had the soup of the day. That was ok also had stuffed mushrooms. Very good. Beer was cold. Had the fish fry with corn fritters. Also very good. If you want good food. And out of the way spot. What a great find.